So why there so much of interest below the city? 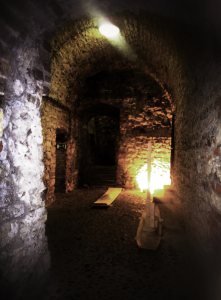 Well, if you have been on our underground walk, you might have noticed that the cellars often look like regular rooms, and that’s because most of these cellars weren’t originally intended to be underground. 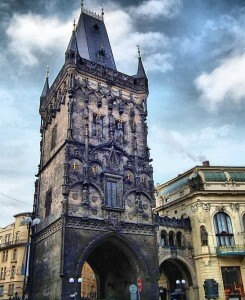 The reason for this is tied both to the history and geography of Prague. There has been a settlement in the area now known as the Old Town of Prague since at least the 9th century, but the town came properly into existence during the 10th century, when Wenceslas I (Good King Wenceslas of the Christmas carol, also St Wenceslas) granted the royal charter that established “Město Pražské”, the Town of Prague. The most important feature of the town was the marketplace, located on the Old Town Square, although there was also a healthy trade in beer and leather, with tanneries and breweries located in the town. If you have been on our Ghosts and Legends of the Old Town tour or Prague All Inclusive Tour, for instance, you might remember the House of the Two Golden Bears in Kožná Street. “Kožná” is a corruption of the Czech word “Kožená” meaning leather, and one of the largest tanneries was located here (though was replaced by a brewery in the 14th century). 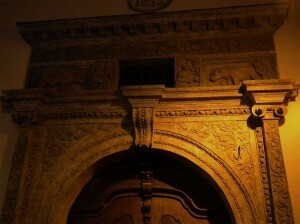 Although the decoration on the House of the Two Golden Bears contains a lot of symbolism related to alchemy, as the builder of the Renaissance house was rumoured to be an alchemist in the employ of Rudolf II, the bears themselves may well relate to the leather makers who were on the site previously, as Czech leather often came from bear hide rather than cows. Many of the merchants, brewers and tanners built houses for themselves near the square. Very soon after the houses started to appear, however, the inhabitants of the fledgling Old Town realised they had a problem. They were very close to the River Vltava, which provided them with a valuable trade route and means of carrying goods and stone for construction up to the city, but was also a constant threat, thanks to its tendency to flood on a regular basis. Prior to the construction of the embankments in the nineteenth century, which now mean that only a very severe flood poses a danger to the city, if the river broke its banks there was a real possibility that the waters would reach as far inland as the Old Town Square, and so the ground floor rooms of these new houses were periodically waterlogged. After a while, when it was obvious this was a regular problem and not just a freak event, they townspeople decided to do something about it. Anything that could be salvaged from the ground floor was moved up a storey, and the street level of the Old Town was gradually raised, initially by about 4m. That entire level of Prague became the cellars, and that’s the reason these clubs and restaurants have such vast and beautiful chambers underneath their main buildings, because those rooms were not intended to be underground and in the dark. Interestingly, the House of the Two Golden Bears supposedly possesses a labyrinth of these chambers and cellars, some of which actually joined up with the cellars of surrounding buildings. Traces of buildings from the fourteenth century have been found in the basement of the current house, but legend has it there are also secret tunnels once used by the criminal fraternity of Prague, and these were said to lead all the way to the Church of Our Lady Before Týn and the Old Town Hall. The Old Town Hall itself is actually composed of row of houses. 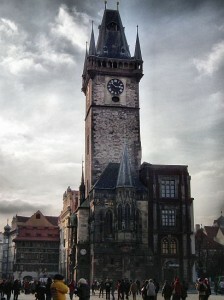 The original building is the one which now houses the astronomical clock and tower, although these features were added later. This was built as a freestanding house next to a small stream for a man named Wolfin of Kamen. It was adopted by the newly formed Old Town Council in 1338, after the town was granted the right to have its own ruling body for the first time, but the date of its original construction is unclear, though is believed to be the mid to late thirteenth century. An extension of the house was built in around 1360, and the tower was added to the Wolfin house about four years later. Then a house belonging to one of the fur and leather traders, a man named Mikeš Kaček, was purchased in 1458 from his widow and connected to the existing structure. This building is known as the Miksův House and has Romanesque foundations. Later the town hall bought another Romanesque building, the U Kohouta house (whose name means ‘At the Rooster’), in around 1830 and this was also added to the Hall, and finally the building next door, U Minuty, was added in 1896. 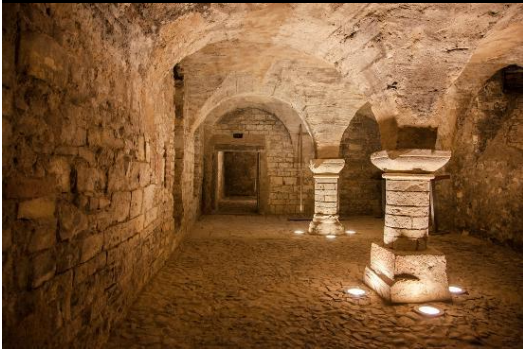 If you take one of our underground walks, you can see the different architectural styles as you walk beneath this row of houses, and you’ll also hear how, in the mid-fifteenth century, these chambers were converted to house courtrooms, dungeons and torture chambers for religious prisoners. 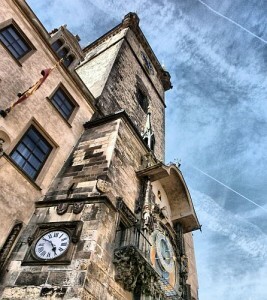 The Old Town Hall. The different coloured houses are all now part of the Old Town Hall but were once individual buildings. It’s difficult to say with any certainty exactly when the raising of the street level took place, as records generally in Prague are scant, thanks to various wars and regime changes throughout history, and particularly after the destruction of a large part of the Old Town Hall and its records in the Prague Uprising of May 1945, but there are a few clues as to when this might have taken place. 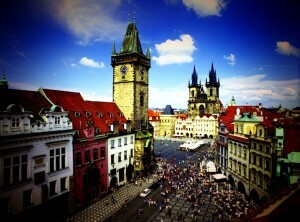 Up until 1784, Prague wasn’t really a city as such, but rather a group of four towns. That’s why you’ll find areas called the OId Town, New Town, and Lesser Town (Malá Strana), and the fourth town was Hradčany, which is the area surrounding Prague Castle. Each of these was treated separately in terms of legislation, governance, parish churches etc up until 1784 when the Emperor Joseph II combined all four and made the Old Town Hall responsible for the whole of Prague’s administration. Each town had its own defences until then, but these were torn down during the amalgamation. You can still see remnants of them, however. For instance, the Malá Strana tower of Charles Bridge was part of that town’s wall and ramparts, and the Powder Gate (Prašná Brána) on Náměstí Republiky was one of thirteen gates set into the walls of the Old Town, (although the current version was actually built in 1475, replacing the original gate, and then was extensively remodelled between 1875 and 1886). The street that runs past the Powder Gate and connects Wenceslas Square with Náměstí Republiky is called Na Přikopě, which in English means ‘On the Moat’, and lies along the line of the original ditch that was dug out alongside the wall to give added protection. Parts of this ditch still exist in the sewer system beneath Na Přikopě and Náměstí Republiky. The current theory is that the earth used to raise the streets of the Old Town came from the excavation work that produced this moat, that the people of Prague basically solved two problems with the one piece of construction work. Most sources say the construction of the town’s walls and gates began around 1235, during the reign of Wenceslaus I, but later the construction work moved to the Malá Strana, under Přemysl Ottakar II, in around 1257. There were originally two walls, one of quartzite and an inner wall constructed using slate. The moat certainly existed during the latter half of the thirteenth century and so was probably built around the same time as these first walls. We know this from archaeological work carried out between 1997 and 2000 on Na Přikopě, during which parts of the moat were excavated and examined. The original ditch was around eight metres deep, and was a dry moat. Since it was dry, however, the Old Town had a constant problem keeping the moat free of rubbish, so that it would continue to be a defensive structure, and eventually a decree was passed in 1347 forbidding any dumping of rubbish in the moat, although deposits of garbage have been found in the drainage ditch built to keep the moat free of rainwater, dating to around the early fourteenth century and continuing throughout its existance. It’s most likely therefore that the street level was raised shortly after the construction of the walls and moat in the 1230s, though it was a gradual process and took decades to complete. Initially the level was raised by 4m but in some places this was inadequate and the level had to be raised again to around 6-7m. The Wolfin House, the building that became the Old Town Hall and now houses the astronomical clock, was built around about the same time, the mid 1200s, but as you can see if you take one of the tours to the underground, its basements still have some remnants of their original purpose as kitchens, ordinary rooms etc. So the Wolfin House must have been built just before the street level was raised. If you do take the tour into its cellars, you’ll notice there are a lot of wells and pits dotted throughout the chambers. One of these, in the kitchen, still has water as it’s supplied by an underground spring, but the others are now dry and may even have been used as part of the prison complex when the rooms were eventually turned over to this purpose. Originally, though, these pits were intended as reservoirs to collect rainwater. The main reason for this was that if ever the city was under siege, there was the threat that the attackers might poison the water supply to try and force a surrender. Having your own independent supply meant you could withstand the siege a lot longer. So obviously the builders of the house were expecting trouble. This would also support the theory that it was built at roughly the same time as the defensive walls, when the safety of the city was the main priority for the authorities and residents of the day. At first, the concern for the Old Town and the reason for building the walls was more about protecting the wares and produce from the markets inside than fending off an attacking army, but towards the end of the thirteenth century and into the beginning of the fourteenth, the political safety of the town became more of a concern. It’s possible even that some of the reservoirs were added to the Wolfin house at this time, after the lower storey was buried, to add to the security of the house. The reason for this sudden concern for the safety of Prague, and indeed of Bohemia as a whole, actually goes back to the founder of the Old Town, King Wenceslas I, and his descendants. Wenceslas was a member of the Přemyslid dynasty, who were said to be descended from Princess Libuše and her husband Přemysl, legendary founders of Prague. The Přemyslids ruled until the early fourteenth century, and not just in Bohemia. At times their empire included parts of Hungary, Poland, Austria and even stretched at one point as far as Belarus.However, in 1306 the last male heir to the royal line, Wenceslaus III, was murdered whilst campaigning in Olomouc to win support for his bid to claim the crown of Poland. Wenceslaus, only a teenager when he died, was childless and survived only by his three sisters, Anne, Elizabeth and Margaret. After his death, Anne’s husband, a German prince named Henry of Carinthia, was elected King of Bohemia, however this claim was challenged by the Austrian Rudolf of Hapsburg who also claimed he had a right to the Bohemian crown through blood ties to the Přemyslids. During the struggle, Anne and her husband fled Prague for Carinthia, although they did not stay away long. Rudolf died after only a year on the Bohemian throne. However, although Anne and Henry returned to begin their rule again, Elizabeth, against the couple’s wishes, arranged to marry John of Luxembourg, also known as John the Blind. The marriage enraged Anne and the two sisters refused to speak again. In 1310, John arrived with his army to take the city and according to legend, as John reached the walls of the Old Town, Elizabeth had all the church bells of Prague ring out to signal to John that he could enter in peace. Henry and Anne were sent into exile, back to Carinthia, and Elizabeth and John took control. (If you take a walk around the Old Town Square, beside the Kinsky Palace and Týnská street, where our office is located, you may see a medieval building with a stone bell carved on the corner of the wall. This is actually known as the House of the Stone Bell and is believed to have been built for Elizabeth, the bell being placed there as a reminder of the historic surrender of the city to John). It would make sense that, with the death of Wenceslaus III in 1306, and perhaps even during his reign, as he was the last of the dynasty and produced no heirs, the Old Town would have suspected that they might well be left vulnerable to foreign claims on the crown, and so should think about defending themselves. Construction of the walls however continued throughout the fourteenth century, in particular between 1346 and 1350, during the reign of Charles IV, son of John of Luxembourg, during his extensive rebuilding of the city. So now, especially in the Old Town and Malá Strana, the two areas right on the banks of the Vltava and so most at risk from the floods, you’ll find many of these underground rooms now being used. As we’ve mentioned, you can visit those beneath the Old Town Hall on our walks, but there are other historical cellars that can be viewed by the public. Another noteworthy underground complex is that of U Kunštátů in Řetězová, which has now been converted into a restaurant, but is of a similar age to parts of the Old Town Hall’s cellars, dating to the mid-thirteenth century. The house at U Kunštátů takes its name from its builder, Boček of Kunštát and Poděbrady, who was a courtier at Prague Castle. Perhaps its most famous resident, however, was King George of Poděbrady, Bohemia’s first Hussite king (the metro station, Jiřiho z Poděbrad on the green A line, is named after him). 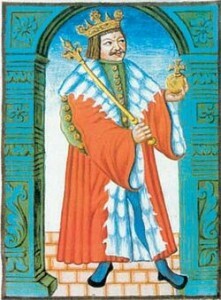 George (Jiři in Czech) lived there from around 1453 to 1458, whilst he was employed as a bailiff in the Old Town, and was a descendant of Boček’s through his father, Viktor of Kunštát and Poděbrady. George, like his father, was a supporter of the Hussite cause. Jan Hus, whose monument stands on the Old Town Square, was a church reformer, executed in 1415 at the ecumenical council of Constance for heresy, when he attempted to submit his views on corruption within the Catholic Church to the council of bishops. After his death, his cause grew in support, and by the mid fifteenth century George was a prominent member, and later leader of the Hussite party. He led military actions against the papal supporters, most notably in 1448 when he raised an army to march on Prague and seize the capital for the Hussites. Soon after, civil war broke out between the Hussites and Papal supporters, but George was able to suppress the fighting and restore order. He was eventually appointed as administrator for the city, since the king at the time, Ladislaus the Posthumous (named as he was born after the death of his father, king Albert II), was still very young. It is during this period that George is believed to have lived at U Kunštátů. Ladislaus was properly crowned in 1453 but soon afterwards began to show sympathies towards the papal cause, which led to more clashes within the city, but in 1457 Ladislaus died. His death was so sudden that some suspected George of having poisoned him, although more recent tests, done in 1985, showed he had actually died of acute leukaemia. The following year, George was elected king by the Bohemian estates, and even some of the papal party supported his appointment, partially because he was considered more moderate than some in his attitudes towards the papal supporters, but also because the alternative might have been the appointment of a foreign ruler. It’s believed that George left U Kunštátů at this time, to take up his duties as Bohemia’s first Hussite king. The house, however, continued to be used as an official royal residence until the king’s death in 1471. Nowadays, like the Old Town Hall’s cellars (which were, in fact, converted to dungeons originally to house Hussite prisoners), U Kunštátů is also used as an art gallery, but it is also a restaurant. Although not connected with the raising of the streets, another fascinating underground structure in Prague can be found at Vyšehrad, on the east bank of the Vltava. From vantage points such as Prague Castle or the Old Town tower you can see the twin towers of the neogothic church of Sts Peter and Paul at Vyšehrad, which dates to the fourteenth century (but was extensively rebuilt in the nineteenth). Vyšehrad itself, in legend, is where Princess Libuše paused with her entourage and had a vision of a city ‘whose glory would touch the stars’, and founded a settlement there which would grow to become the city of Prague. Although there is evidence of prehistoric settlement in that area, the first fortress at Vyšehrad did not come into being until the tenth century, but was for a time the royal palace before Prince Bořivoj II moved the court to Prague Castle. The fortress was fell into disrepair after the court moved to Hradčany and although Charles IV did instigate some repairs, it was eventually ransacked by the Hussites and later by king George of Poděbrady in 1448 when he marched into Prague to take the city. The fortress was rebuilt in around 1654 on the orders of Ferdinand II, a strictly Catholic monarch who angered many of the Protestant nations of Europe by his decision to execute 27 Czech noblemen who had rebelled against him to defend their right to observe the Protestant (Hussite) faith and to protest Ferdinand’s favouritism for Catholic lords. You can see the site of this execution as part of the Ghosts and Legends of the Old Town tour and the Underground Walk. Ferdinand’s actions were the trigger for the Thirty Years’ War, and Prague was invaded by both the Saxon and Swedish army, before the war was finally ended by the Peace of Westphalia, signed in 1648. Spurred by the knowledge that one of his lands had very nearly been taken from him, Ferdinand had Vyšehrad rebuilt. Beneath the Baroque fortress are a series of casemates, passages within the defensive walls or ramparts of the fortress meant to allow the movement of troops without the enemy noticing. During the eighteenth century, gunpowder was stored in the tunnels, so that in the event of an enemy occupation, the last soldier to leave the garrison would light the fuse and destroy Vyšehrad altogether. In the 1840s, the structure was renovated again, and a hall constructed at one end of the tunnel system, known as the Gorlice Hall, meant as a muster point for the soldiers if the casemates were ever used. This was later used as an air raid shelter during World War II, and then as a storeroom for vegetables and potatoes, before finally being cleared out, along with the rest of the casemates, and opened to visitors in the early 1990s. 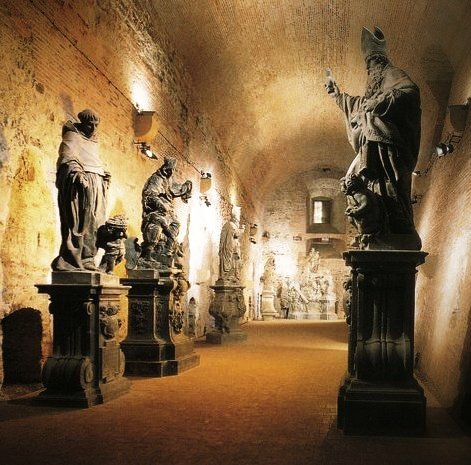 Nowadays, the casemates and Gorlice Hall are used as an art exhibition space, both for modern art and historical sculptures, including a selection of original statues that once stood on the Charles Bridge. The Gorlice Hall also plays host to theatrical productions on occasion. There are also supposedly underground chambers beneath the House of the Stone Bell, which was mentioned earlier. 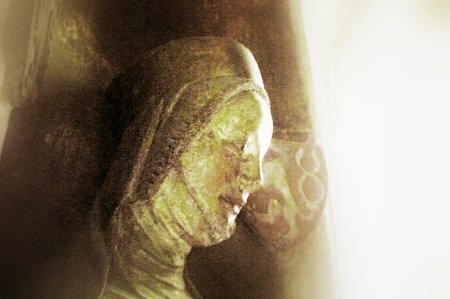 According to legend there is a chapel beneath the house, dating to the tenth century when Christians were a minority group and fearful of persecution from the pagan rulers of Bohemia, particularly Princess Drahomira, the mother of Saint Wenceslas (whom you can hear about on our Prague Castle After Dark tour). Indeed, there are stories of secret tunnels and passages beneath many of Prague’s famous landmarks, which may await discovery if ever it’s possible to excavate beneath the buildings. Returning to the Old Town Hall, it is possible that there will soon be even more discoveries made about the buildings that once occupied that corner of the square. As mentioned earlier, a large part of the Hall was destroyed in 1945 by artillery fire during the Prague Uprising – originally the Hall had a neo-Gothic wing dating to the nineteenth century on its eastern side, which stood where there is now a small park and souvenir booths, next to St Nicholas’ church. There are plans to excavate this park fairly soon, to see if anything remains of the buildings that existed before this wing, known as the Nobile House, was constructed. Experts believe that there are more Romanesque cellars waiting to be found down there, and are even calling this ‘The Prague Pompeii’, as they believe many of these cellars and whatever was left behind in them, could be fairly well preserved. If all goes to plan, the archaeological work should start in 2013 and last for around two years. Is there more to be found beneath the Old Town Hall? For more information on how you can visit the Old Town Hall’s underground complex or any of the places mentioned in this post, visit our website or ask a question on our Facebook page, or when you’re in Prague, speak to our staff at our office at Týnská 7, Old Town.